A two-layer version of the Hummingbird cake, made with mashed banana, crushed pineapple, toasted chopped pecans, and fluffy cream cheese frosting. Butter two 9 x 2-inch round cake pans. Line the bottom of pans with parchment paper. Butter the paper and dust pans with flour, tapping out any excess; set pans aside. Place all ingredients in the bowl of an electric mixer fitted with the paddle attachment and beat at low speed until ingredients are moistened, than beat at medium speed for 2 minutes. Divide mixture between prepared pans. Bake until golden brown, and a wooden pick inserted in the center comes out clean, about 30 to 40 minutes, rotating pans halfway through baking. Cool cakes in pans for 10 minutes on wire racks. Remove and cool completely on wire racks before frosting. To assemble, Place one cake layer, bottom side-up, on a serving platter. Spread with 1/4-inch layer of frosting. Place the second layer, right side up, on top of the first layer and frost the top and sides of the cake with the remaining frosting. Garnish with toasted nuts and coconut, if desired. Refrigerate until ready to serve. Store any unused portion, covered, in the refrigerater. 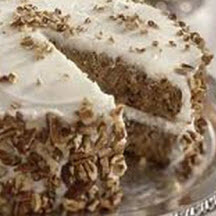 For Cream Cheese Frosting: Beat butter, cream cheese and vanilla at medium speed with an electric mixer until blended. Gradually add powdered sugar, beating until light and fluffy. Makes 3 cups frosting.